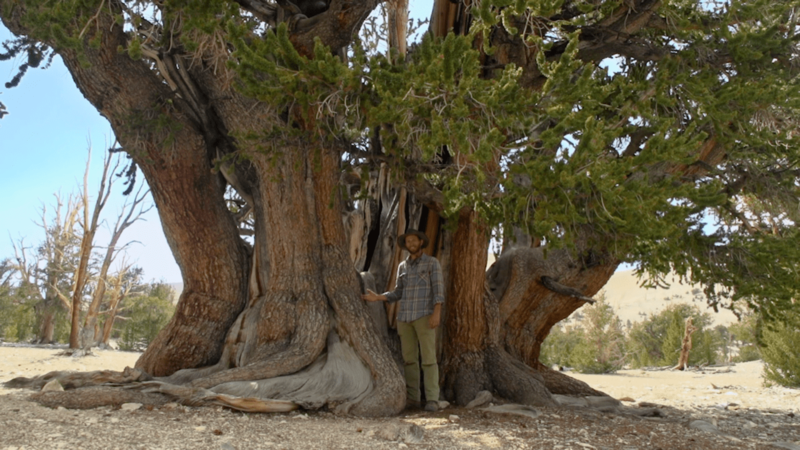 Brian Smithers, a researcher assistant professor at Montana State University, is standing in front a massive tree in California’s White Mountains, an arid range near the edge of the Great Basin. “It’s been around for quite possibly longer than the entirety of Christianity, never mind Western civilization,” he says. The tree is the bristlecone pine, known for thriving under harsh, dry conditions. The species is also known for its extreme longevity. “We’re talking upwards of 5,000 years,” says Smithers. The key to the tree’s long-lived lives is its incredibly slow growth, which results in very dense wood. The dense wood is useful—the trees can withstand insects, rust, and winds up to one hundred miles per hour. The question is how these trees will struggle, or thrive, with a changing climate. As the climate warms in this region, the bristlecone moves upslope to continue to live in its ideal temperature range. “Our research has shown about a 20 meter vertical upslope average increase over the last 50 years,” Smithers says. But the mountaintops are already crowded with both with bristlecone pine and some upstarts who want to move into the neighborhood. Limber pines are another tree in the harsh region that usually live further downslope. The species is long-lived, but a relative sapling compared the bristlecone pine—it can live roughly between 1,600 and 2,000 years. Given the new competition, Smithers is uncertain about the future of the bristlecone pine. Raccoons: Tricky Trash Pandas Or Misunderstood Masterminds? Raccoons are highly successful critters, even in the face of a changing environment.